They’ve got a saucy staple at Dal Dong Nae in Old Koreatown. 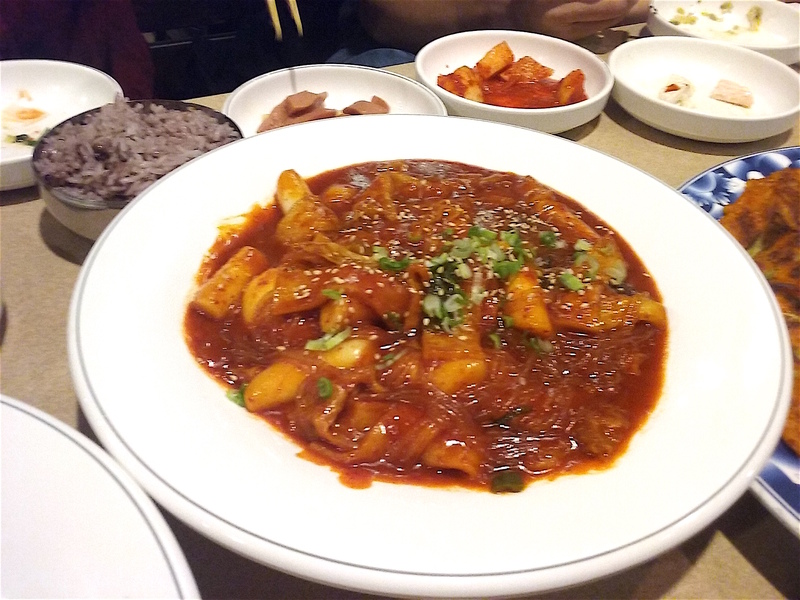 If anything looks like the culinary equivalent of an inferno, it’s the Korean dish of rice cakes in spicy chile sauce, tteok-bokki (or ddeokbokki), of which they serve an excellent version at Dal Dong Nae Chicken & Hof in Old Koreatown off Royal Lane. In tteok-bokki, they drink up a lava of a sauce that’s brilliant red with gochugang (Korean chile paste) and has undercurrents of sesame oil and garlic. The dish is simmered till the tteok are soft but still chewy, and the sauce thick and coating, with a sweet, almost wheat-y flavor that’s uncannily addictive. At Dal Dong Nae, the bowl of fiery carmine red—you can think of it as an insanely spicy red-sauce noodle/dumpling dish—comes with sweet potato vermicelli noodles tangled with plump shiitakes, hard-cooked egg, and wrinkly, wonderful fish cake (essentially surimi with flour, seasoning, and vegetables). Scallions add a flourish of green on top. The vermicelli noodles are the same ones they use in their very good version of the popular japchae, and altogether, the dish gives you plenty of purchase on the outrageously vibrant, strangely crave-inducing sauce. At many places, tteok-bokki can be an afterthought. Not here, where the dish has many layers, as many of their dishes do. All you need is a flowing supply of soju.